Originally published under the title "Turkey: Kurdish Activist Arrested for Social Media Posts on Armenian Genocide." Kurdish human rights activist Mukaddes Alataş is under arrest in Turkey for posting about the Armenian Genocide on social media. Mukaddes Alataş, a Kurdish human rights activist from Diyarbakir, was recently arrested for "being a member of a terror organization." Her crime? She posted about the Armenian Genocide on social media and engaged in women's rights activism. Unlike the relentless denial of the Turkish government, the Kurdish political movement in Turkey recognizes the Armenian Genocide and commemorates it. On April 23, 2013, for example, an event was organized by the Diyarbakir Bar Association, then led by Kurdish lawyer Tahir Elçi, and the Diyarbakir Municipality, to commemorate the 98th anniversary of the destruction of the Armenian community in the city. "Today, we commemorate the genocide in Diyarbakir for the first time. This is a very important day for us. We bow respectfully before the memory of our Armenian brothers who were murdered in 1915, and condemn the genocide," Elçi said in his speech. A scene from Tahir Elci's funeral. 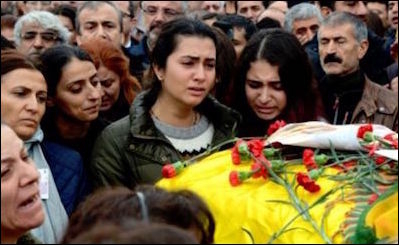 Two years later, on Nov. 28, 2015, Elçi was murdered in broad daylight while he was holding a press conference, in which he spoke about the destruction caused by the military attacks carried out during the curfew imposed by the Turkish government in the Sur district of Diyarbakir. In his last public speech, he called for an end to violence between the Turkish state and the Kurdish PKK (Kurdistan Workers' Party). Though almost two years have passed, his murderers have still not been brought to account. Our connection with Elçi's file has been cut. We are not given the copies; we do not know at what stage it [the file] is... But there are things we know. There is not a single suspect in the file. The gun with which Elçi was shot has not been identified because the cartridge bullet has not been found. As there is no certain evidence, no progress has been made to shed light on this murder. We have made more than 100 requests from the Diyarbakir prosecutor's office, but we do not know what has been done about these requests. For the prosecutor does not give information either to the public or to us. 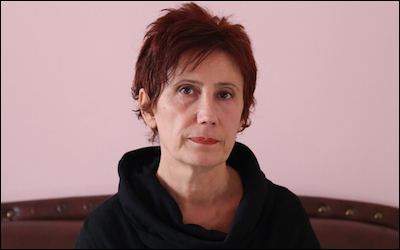 Similarly, lawyer Neşet Girasun, a board member of the Diyarbakir Bar Association, told The Armenian Weekly: "An effective investigation that would reveal the perpetrators as well as the forces behind them has not been launched." Many Kurds were victims of kidnappings, torture, and murders at the hands of Turkish state forces in the 1990s. Elçi worked vigorously to shed light on what has come to be known as "murders by unknown assailants" in Turkey. Ironically, he became a victim of one himself. The Kurdish political movement in Turkey recognizes and commemorates the Armenian Genocide. In the meanwhile, Sedat Peker, a gang leader, who has been convicted of several crimes and is a staunch supporter of President Recep Tayyip Erdoğan, was given the "most benevolent businessman" award by the Turkish 2K Media Company on May 24. Peker had threatened academics who signed a petition calling for peace between the Turkish government and the Kurds in early 2016. He said that he wanted to take a bath in "the blood of the academics." Peker has not yet been brought to account for his statements openly calling for mass slaughter. Turkey not only denies the Armenian Genocide but also violently crushes any voice that dares tell the truth about it. Meanwhile, those who incite mass murder against dissident academics and peace activists are protected, promoted, and awarded.